After an unexpected delay where the referee failed to show up on time, a knock on effect of the game being moved to an earlier time perhaps and no notification to the referee, Tom Lorton eventually made his way to Drumbaragh on short notice and the match between Ballinlough and Drumbaragh finally got underway 30 minutes after schedule. With the late start, both sides started fairly sluggish with only two points apiece being traded in the first 15 minutes before Drumbaragh got the first significant score of the game when they rattled the back of the Ballinlough net with a well taken goal. This was followed up with a pointed free before Jonnie Reilly got Ballinlough scoring again with two well taken scores, one from a free and one from play. Further points were traded from frees with Niall Farrelly accurate twice in as many minutes, from a free and then a wonderfully well worked score from play. Drumbaragh hit back with two points, one of which was a superb effort from about 45 metres out to leave them 5 to the good at half time on a scoreline of 1-08 to 06 points. Having it all to do in the second half, Stephen Baxter may have had a few choice words for his charges in the dressing room at half time and they came out in the second half a different team. Tommy McCullen kicked off proceedings with a mighty effort from play before Niall Farrelly added another free to his tally and then another great score from play. That was to be his last score unfortunately as he had to go off injured and was replaced by Conor Briody. Drumbaragh got their first point of the second half from a free, although there was confusion amongst the umpires if the ball had actually gone between the posts,but the referee marked it down as a score. The lack of a scoreboard didn’t help ease the confusion on the scoreline for the supporters. Ballinlough seized the initiative in the 43rd minute when Jonnie Reilly scored his 3rd point and Tommy McCullen added another before some quick thinking by Simon Deevey with a free going short and feeding the ball into SuperSub Conor Briody who finished to the net to put the ‘Lough in the driving seat. Drumbaragh got a point from play before Mark McCullen got himself on the scoresheet with a fine effort. Heading into the 54th minute both sides were guilty of conceding silly frees and Lorcan Maguire put two frees over the bar to match the efforts of the Drumbaragh kicker. Two points up with time on the clock over, Ballinlough had a chance to put the game to bed in the 63rd minute when some savage work by Jonnie Reilly found the ‘Lough with men over in the Drumbaragh box but Conor Briody just couldn’t get the ball to position itself into the net!! Perhaps a simple point would have been a better option but hindsight is a wonderful thing. Maybe to make up for being late, the referee inexplicably played almost six added minutes and it was in the 66th minute that Drumbaragh got the decisive score, a goal that was to be the winning of the match. After working tirelessly to get themselves back into the game Ballinlough will feel they left this one behind them, whilst Drumbaragh can count themselves lucky thanks to some dubious referee decisions. Full time score Drumbaragh 2-12, Ballinlough 1-14. Joshua Lynch scored 3 Points for Ballinlough in a disappointing B'League Opener on Thursday evening. ​Walterstown made the trip to a very breezy Ballinlough and it was the Men in Black who came out of the starting blocks the sharpest. A goal and a point on the board before Ballinlough even got a touch of the ball paved the way for what was a comprehensive win for Walterstown. In fact they hit 1-08 without reply in the first 20 minutes before Joshua Lynch opened Ballinlough’s scoring account, which ended up being short lived as Walterstown worked the ball well down the field and finished firmly to the Ballinlough net. James O’Higgins hit back with a point from a free, taking a large touch of the Walterstown keeper, but it was Walterstown who finished the scoring for the half with an excellent point from play, one of many, in the first half. Scoreline at half time 2-11 to 0-02 points.Ballinlough started brighter in the second half scoring 2 quick points, one of which, again assisted over the bar by the Walterstown netminder. The next ten minutes were dominated by Walterstown who hit 1-02 without reply, but Ballinlough were left to rue some wayward shooting in this period. Although, a combination of good defending and the stiff breeze meant this was to be the last scoring for Walterstown. Ballinlough kept attacking the Walterstown rearguard and were rewarded when Eoghan McCabe scored a fine effort before substitutes Mattie Farrell and Veteran Kevin Devine also found the sticks. Unfortunately it was too little, too late on what was a dismal night for the ‘Lough. Final score Walterstown 3-13 to Ballinlough’s 0-07points. The cobwebs have now being shook off and the lads will regroup and go again the next day. Niall Farrelly returned to the Ballinlough line up and helped himself to 1-05 of Ballinlough's overall score v Moynalty in Ballinlough on Sunday morning. Fresh from promotion to Division 3 last year and already with 2 wins from 2 games in 2019, Moynalty came to Ballinlough looking to make it three in a row. This was the first meeting of these two teams in a first team competitive game since 1986 and both sides were eager to take the spoils today. Moynalty came out of the blocks quickest creating a goal chance with the first play of the game, only to be denied by the reflexes of Dereck Muldoon in the Ballinlough net. They did however open the scoring with a pointed free on 04mins. This action seemed to spur on the home side who kicked into action sending over the next 5 points without reply, with Niall Farrelly sticking two frees and Paddy Briody, Benji Smith and Joshua Lynch all scoring from play. Struggling against the stiff breeze it took Moynalty until the 19th minute to add their second point, again from a placed ball, and 22 minutes to score their first from open play to get themselves back in the game. They went on to take the lead a moment later when the ball found its way into the Ballinlough net to give the visitors a much needed boost. It was only to last for a minute however, as Ballinlough reacted superbly to the concession of the goal by producing some of their finest football and great work by Benji Smith working the ball up the field leaving Niall Farrelly with the simple task of palming the ball to the net to give the hosts the lead once again. Farrelly was on target again just before halftime with a pointed free to leave the home side three ahead at the break on a scoreline of 1-06 to 1-03. Ballinlough opened the scoring in the second half with a point from play from the boot of Joshua Lynch before Niall Farrelly missed a free from a difficult angle against the breeze. Again Moynalty came looking for a goal to get themselves back into the game and again they produced the goods to lower the deficit to one point with 35 minutes gone on the clock. Further points were traded both from frees before Jonnie Reilly got himself forward and sent the ball over the bar on 41 minutes and again two minutes later to push Ballinlough’s lead back out to three points. Moynalty hit back with a contentious point, with the referee over-ruling his own umpire to award the score, and another point from a free on the 46th minute mark to leave just one between the teams again. What followed was a period where Ballinlough retained possession well, cautious not to cough up any easy ball to the Moynalty attack, whilst also making ground up the field. It paid off too when a lapse in concentration in defence led to a free in for the hosts and Niall Farrelly put two points between the sides once again in the 55th minute. This was to be the last score of the game and despite referee Martin Dawson playing over 4 and a half minutes of added time,Moynalty couldn’t get that third goal that would have left them unbeaten in the League. Instead it was Ballinlough’s day and with 5 points from a possible 6, Stephen Baxter’s men are currently sitting comfortably in third place in the League standings. Next up for Ballinlough is an away game in two weeks time with neighbours Drumbaragh providing the opposition. Lorcan Maguire helped himself to an impressive 7 points v Longwood. ​Ballinlough made the arduous journey to South Meath to take on the might of Longwood in Round 2 of the Division 3 A’League this evening in baltic weather conditions. On a night where the mercury hit -1, the temptation to skip this game, sit by the fire in Stoney Burke’s and watch the opening of the 6 Nations was strong and judging by the lacklustre crowd in attendance I’d say more than a few took up that offer... although the Ballinlough Faithful were pitchside alright! As for the game, both sides traded early points both from frees with Ballinlough the more eager early on constructing a good goal chance that manifested into nothing but showed the intent the visitors had for this game. Lorcan Maguire added a second point from a placed ball before adding a third well worked score from play on 15 minutes. Simon Deevey, fresh from his rugby exploits (and no doubt wanting to get back to the warmth and watch Wales take on France!) added a fourth point for the visitors to stretch their lead to 3 points. Longwood, however, were cleaning up in midfield and it was from a well caught “Mark” in the centre of the field on 18minutes, that they launched their next attack which resulted in the ball landing in the Ballinlough net. They then added a point from play and another from the boot of Ryan Moore who was deadly accurate on free taking duty, similar to his exploits in the Intermediate Final of 2018. Ballinlough finished the half the stronger though with Maguire again scoring from a free, before the Briody Brothers both found the sticks, firstly Paddy on 27minutes, and not to be outdone by his little brother, Conor also saw a fine effort sail over the bar a minute later leaving Ballinlough with a one point lead at half time. The second half started much like the first with both sides trading early scores from frees. Ballinlough then worked the ball superbly down the field and great team-work ending with a well taken score from Mark McCullen on 38minutes. Longwood produced a fine effort of their own a minute later from play leaving just two points between the teams. Then came the game changer with Ballinlough Captain Johnnie Reilly, doing what he does best, coming bursting forward from the half back line, working the ball up the field, to ultimately end the move with a cool finish to the Longwood net on 41 minutes. Longwood refused to give in and got the next point from play, before Lorcan Maguire added another free to his haul of scores. There then followed a period of about ten minutes with both sides very wasteful when in possession, before Johnnie Reilly once again got forward and scored a great point from out on the wing on 57 minutes. Paddy Briody added a second point to his tally a moment later leaving 7 points between the sides. Longwood rattled off two late scores, one from play and one from a free to lower the deficit, but it was Ballinlough who got the final score with Robbie Farrell getting forward and repeating his trick from last year against the same opposition, slotting over the bar to leave Ballinlough comfortable winners on a score line of 1-14 to 1-08. Next up is a home game against Moynalty next Sunday at 11AM in Ballinlough. ​Ballinlough started their 2019 Division 3 League campaign with a draw v Blackhall Gaels in bright but bitter cold conditions in Ballinlough this morning. Blackhall took an early lead after three minutes and had the benefit of the strong breeze for the first half adding a second point from a free with the wind playing havoc with Ballinlough’s kick out and putting them under pressure in the early stages of the game. Niall Farrelly got Ballinlough off the mark with a 09th minute free but Blackhall replied with a point of their own also from a free. Lorcan Maguire kept Ballinlough in it with a well taken score before Blackhall Gaels edged out in front once again with two consecutive frees. Further points were traded with Mark McCullen finding the sticks for Ballinlough on 28minutes before Blackhall Gaels finished the half with a point and taking a 0-06 to 0-03 point lead in at the break. Ballinlough started the second half the brighter of the two teams, with Niall Farrelly scoring a free on 37 minutes before Michael Geraghty scored an absolute peach of a point on the 45 minute mark. Ballinlough manager Stephen Baxter felt a few changes were needed and brought on youngster Darragh Cafferry and experienced hand Conor Briody in place of Junior Reilly and Paddy Briody. It was to be an inspired decision as Caffery finished to the net just two minutes after coming on the field to put Ballinlough in the lead for the first time. Blackhall Gaels regained their composure and got themselves back in the game with a free kick and a well taken score from play to leave the sides level on 55 minutes played. Ballinlough had plenty of chances to find a winner but went wide of the posts on a number of occasions,before then having a glorious opportunity to put the game to bed with a goal chance but Joshua Lynch’s effort in the 60th minute was well saved by the Blackhall Gaels netminder. Three added minutes followed but neither team could make the breakthrough and referee Martin Dawson blew up to end the game on a draw. Final score Ballinlough 1-05 Blackhall Gaels 0-08points. 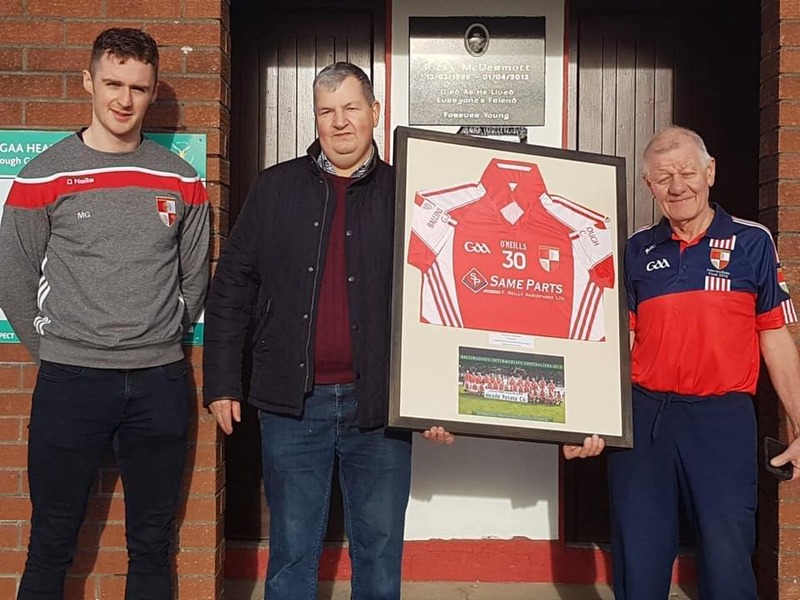 Ballinlough Captain Michael Geraghty and Chairman Donal Crossan presenting a Ballinlough Jersey to sponsor Fenian Reilly. A recent presentation to our main Sponsor for the past 3 years Fenian Reilly and Same Parts. Fenian has been a massive supporter of the club for years and his support over the past three years as our main jersey sponsor has been very much appreciated. Thanks Fenian for all you have done for the club over the past three years and we hope to see you cheering us on at our games in the future!! Hard to pick just one...but congrats to Man of the Match, Ronan McGuinness. We are lucky to have a player of such commitment on the field (is pretty entertaining off the field too!). Ballinlough returned to winning ways in the final of the Corn na Boinne with a convincing win over neighbours Oldcastle. In near perfect conditions on Sunday in Pairc Tailtean, the men in red imposed themselves and took the lead after 3 mins with a Peader Byrne free and led for the rest of the game. A point from the well marked Ronan McGuiness was followed by a point from Peader Byrne before Oldcastle got their first point after 14 mins. The ‘ Lough were moving well with Johnny Reilly, Sean Geraghty and Podge Muldoon all working well and never let the town team settle. Two more points from the unmarkable Byrne left it 5 to 3 at half time. The Reds remained unchanged for the second half while Oldcastle made 2 changes. With Tommy McCullen and Michael Geraghty working tirelessly, Ballinlough were in the driving seat and points from Ronan McGuiness, Peader Byrne (2) and Simon Deevey stretched the lead. It was on the 20 minute mark when the killer blow arrived when Ronan McGuiness finished to the net after some brilliant inter play among the forward. Surging runs from Mark McCullen and Benjy Smith piled on the pressure and they were rewarded with another goal this time from Tommy McCullen. While Oldcastle did have their chances saves from the outstanding Derek Muldoon in goals kept the Reds in control. Brian Donohoe ‘s charges used all their experience to finish out the game and forced Oldcastle into shooting from long range. With Robbie Farrell , Emmet Smith and Mattie Farrell tenacious in Defence there was only going to be one winner. A special mention of the outstanding Lorcan Maguire who postponed a trip to the states to stay back and play in the final. A late Oldcastle goal wasn’t enough to spoil the party and the large vocal Ballinlough supporters celebrated at the sound of Cormac Reilly ‘s whistle. This was the third victory over Leo McEnroe ‘s charges this year and will go in some small way to ease the pain of loosing the IFC final a few weeks ago. The Lough can look back on a year when the media tipped them for relegation yet persevered and became IFC finalists, won the Corn na Boinnie and consolidated their league position. Ballinlough turned on the style in the semi final of the Corn na Boinne at Carlanstown on Thursday night. In their first outing since loosing the IFC final the ‘Lough were in control from start to finish. Goals in the first half from Ronan McGuiness and Simon Deevey left Sydan with a mountain to climb. With Peader Byrne on target with the free taking and Sean Geraghty working tirelessly the Reds were fluent in attack and went in at half time 2.10 to 0.07 ahead. Brian Donohoe ‘s men continued on the second half and a spectacular goal was blasted by Mark McCullen ten minutes later. With Emmet Smith working hard and the Reds full back line tenacious, Sydan were finding it hard to make progress but to their credit never gave up and were rewarded with two well taken goals late in the game. Man of the match Ronan McGuiness put away the ‘Lough ‘s fourth goal in clinical fashion to leave thoughts of a final yet again in supporters minds. Others to impress on the night were Johnny Reilly, Benjy Smith, Derek Muldoon and Lorcan Maguire. Ballinlough reached the final of the IFC for the second time in four years courtesy of the tightest of wins over neighbours Oldcastle in Pairc Tailtean on Saturday evening. The two teams had already met with Ballinlough victorious earlier in the Championship and this again was a tight affair. Oldcastle took control of the early scoring registering 3 points while the Reds squandered chances before Johnny Reilly found the back of the net after 12 minutes. Robbie Farrell was replaced by James Baugh with what looked like a serious arm injury as the town team kicked 2 more points. The clock was heading for half time when Peader Byrne put over a free which was quickly followed by points from Ronan McGuiness, Sean Geraghty and Tommy McCullen to go into the break leading 1.04 to 5 . The second half was five minutes old when the reds lost Ronan McGuiness who entangled with the Oldcastle full back who himself had seen red the previous game. This gave Oldcastle the boost they needed and they soon started to take control. A Peader Byrne free was the only Ballinlough score to dent Oldcastle as they fully used the extra man eventually beating Derek Muldoon to find the Reds net. With 7 minutes left Oldcastle were 3 points up and Ballinlough were holding on by a thread grateful only for their opponents wastefulness in front of the posts. It was at this stage that the experience of Ballinlough kicked in and they started the comeback. A Peader Byrne pointed free at 23 mins was quickly followed by a point from Substitute Gary Reilly. With Man of the match Johnny Reilly and Mark McCullen winning possession a lot of play was now in the Oldcastle half. With man mountain Simon Deevey giving the town defence a nightmare frees inevitably came with veteran Byrne drawing the teams level with 3 minutes left. Both teams pushed hard for the winner in the last frantic minutes. With time up Oldcastle conceded a line ball on their ‘ 45 but indiscipline meant the ref brought in the ball 10 metres. With a side wind blowing into his face up stood Peader Byrne to kick a famous winner and start joyful scenes at the end of this thriller. Brian Donohoe’s men lived to fight another day and drew on all their experience to pull this one out of the fire. This is a tough group of players who have been together many years now and never panic and will relish the challenge to play Senior football once again. Ballinlough qualified for this years IFC semi with a hard fought win over last years beaten finalists St Michael’s at Carnaross on Saturday evening. Indeed Ballinlough opened the scoring in the first minute with a fine point from Tommy McCullen. This was followed by 2 pointed frees from Peader Byrne. The crucial score of the game came after 18 minutes when full forward Simon Deevey used his strength well to bundle the ball to the Carlanstown net. Deevey, who won an all Ireland medal with Ashbourne RFC earlier this year, won a lot of valuable possession on what was a wet evening under lights. The goal was soon followed by a superb point from the busy Michael Geraghty. A Peader Byrne point on the stroke of half time left the ‘ Lough 1.05 to 6 ahead at the break. Ballinlough started off the second half where they had left off with man of the match Sean Geraghty pointing inside the first minute. This was quickly followed by a Benjy Smith point. With Johnny Reilly and Lorcan Maguire immense in defence Ballinlough took control of the game. Points from Sean Geraghty, Tommy McCullen and Ronan McGuiness kept the distance between the two teams. Gary Reilly replaced the injured Emmet Smith on 18 minutes and used his height well around the centre. 3 pointed frees from the evergreen Byrne was enough to see The Reds over the line but thoughts will quickly turn now to next weekend ‘ s semi final. Overall it was a well balanced team effort from Brian Donoghue ‘s men who were well served also by Matty Farrell, Robbie Farrell ,Podge Muldoon and Mark McCullen. Ballinlough made It 2 Championship wins from 3 with a win over neighbours Oldcastle in Moylough on a bright Sunday evening. A point in the first minute by Michael Geraghty got the perfect start for the ‘Lough followed by 2 points from Peader Byrne in the next 7 minutes left the game 3 points to 2 after 20 minutes. But Oldcastle dominated the next 10 minutes scoring 1. 03 to go in at half time leading by 6 points. Whatever was said in the dressing had the desired effect as Ballinlough looked a different team in the second half. A goal inside the first minute by man of the match Peader Byrne kickstarted the comeback. Ballinlough, trained by ex Cavan footballer Brian Donoghue, showed a ‘meanness‘ in defence with a rock solid fullback line competing for every scrap. Oldcastle perhaps having a hangover from their recent Div 2 final win could not break down the Reds as attack after attack was smothered out. Oldcastle goalkeeper Conor McHugh while having an off day with his frees made 2 point blank saves from Simon Deevey and James Baugh to keep Oldcastle hopes alive but with Veteran Byrne pulling all the strings the ‘Lough never really looked like loosing. With Mark and Tommy McCullen working well in the middle and Benjy Smith covering acres of ground, the introduction of Gary Reilly put the result beyond all doubt. While it was a full 16 man team effort it would be unfair not to point out the exhibition football played by ex Meath Player Peader Byrne who finished with a personal tally of 2.08 including converting 2 45 ‘s. ​Others to show well were Lorcan Maguire, Johnny Reilly and Emmet Smith. Ballinlough: D Muldoon, R Farrell, P Muldoon, M Farrell, E Smith, L Maguire, J Reilly 0-1, T Mc Cullen, M Geraghty 0-1,J Baugh,S Geraghty, M McCullen, B Smith, S Deevey, P Byrne 2-08, subs G Reilly / J Baugh. Ballinlough finished off their final league match with a win in Kilskyre and moved to the top half off Div 3. This game had no real significance as neither team had anything to gain or loose. The game itself was a good open contest as a result and entertaining to watch. The home team never really looked in trouble with Mark McCullen and Niall Farrelly dominating the ariel exchanges. Both were also on target early with McCullen helping himself to 3 points. The Reds led 9 - 5 at halftime. The free flowing game continued in the second half but with man of the match Johnnie Reilly making probing runs upfield and the excellent Simon Deevey winning a lot of ball upfront the ‘Lough looked comfortable until Longwood converted a penalty leaving only a score in the difference. D.Muldoon,R Farrell (1), P.Muldoon, M.Farrell,J.Baugh,M.Geraghty(2), J.Reilly(2),L.Maguire,N.Farrelly(3),E.Smith,R.McGuiness, M McCullen(3),B.Smith(1),S.Deevey(1.01),J.Lynch(2) subs N.McDonnell,P.Byrne(2),O.McCabe, J O Higgins. Hard luck lads. Six games in three days to reach the cup final - that is some achievement....but only the beginning for these super bunch of lads. You have provided us with a weekend that will live long in the memory and have represented yourselves, your families, your club, your parish and your county with pride, honour and respect. You can now pay your club membership online. ​Family, Single, Student, Walking and Juvenile memberships available. Ballinlough took full points from this Div 3 league encounter at home. Both teams are hovering in the bottom half of the Division so a win was essential for either side’s ambitions to stay up . As it turned out the home team had too much firepower and led from start to finish. With James Baugh immense around the centre Ballinlough were able to move the ball with purpose and built a commanding lead early on. But Cortown as you would expect threatened to spoil the party and found the net twice to reel in the hosts . But with veteran Peader Byrne keeping the scoreboard ticking over with some fine frees there was always daylight between the teams. Mark Mc Cullen got his now customary goal from a long ball played in straight from man of the Match Niall Farrelly. Farrelly won a huge amount of ball around the middle and rounded off an excellent performance with 2 points . Simon Deevey up front caused many problems for the Cortown defence and was rewarded for his work with a second half goal . Cortown converted a late penalty and never gave up but time ran out on a fine Tuesday evening. Ballinlough now sit on 8 points mid table and with only 2 games left may have done enough to stay up while the dreaded drop looms closer for their North Meath neighbours . Ballinlough were well served by Conor Fleming, Tommy McCullen and Mattie Farrell. Ballinlough took full points with a win by the minimum over St Vincent’s on Sunday evening. Both teams were missing regulars and needed a win to move away from relegation. It was Ballinlough who settled in the quickest and soon open up a four point lead . With Mark and Tommy McCullen working well the visitors were on all out attack and should have been out of touch by half time only for some wayward shooting. Only a goal separated the teams after 30 minutes but half time changes seemed to work for the home team . The game was played from end to end with good scores from both teams . This was typified by man of the match Ronan McGuiness who received a lot of attention from the hosts finished with a personal tally of 4 well taken points . A goal from Mark McCullen at the 50 minute stage after good work by Simon Deevey seemed to take the pressure off the ‘Lough . Indeed Deevy who is fresh from a very successful season with Ashbourne RFC , winning an all Ireland title , seemed to improve as the game moved on using his considerable strength to gain vital possession when needed most . But a very dogged Vincent’s scored their second goal of the half with 5 minutes to go to set up a very nervy last few minutes with only a point separating the teams . Both sides had chances but that single point remained when the final whistle went. Ballinlough were also well served by Lorcan Maguire , Conor Fleming and Michael Geraghty. A mention also of the impressive grounds the hosts have developed over the last few years and can feel rightly proud of their achievements. 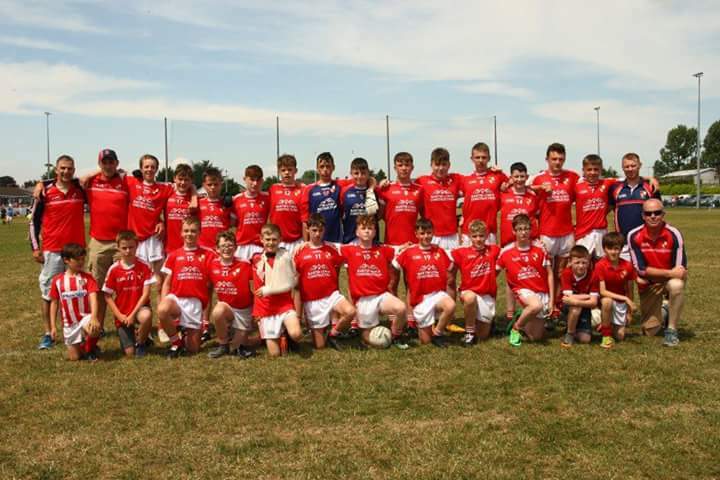 Ballinlough: D Muldoon, C Fleming, P Muldoon, M Farrell, J Baugh , L Maguire, E Smith, T McCullen , M Geraghty, J Tunney, R McGuiness, Niall Farrelly, J Lynch , M McCullen , S Deevey . Ballinlough claimed the honours with a hard earned win over Kilmainham in near perfect conditions on Friday night. With both sides trading scores in the first half there was only a point between the two teams . Kilmainham opened up a five point lead in the second half and looked to be in control . But Ballinlough responded in fine fashion with Peader Byrne kickstarting the revival with a spectacular goal . The home team took control at midfield with Tommy Mc Cullen and Michael Geraghty dominating exchanges. Kilmainham ‘s over reliance on Mickey Newman’s excellent free taking for scores proved costly as Ballinlough finally took complete control but a late late goal from the ‘ spot ‘ by Newman wasn’t enough to save the points . Ballinlough got their first 2 points in this years Championship in Carlanstown with a convincing win over favourites Bective . Indeed it only took Bective 5 minutes to put the ball in the Ballinlough net but 2 minutes later Mark McCullen punched in a high ball from his brother Tommy to score Ballinlough ‘s first goal . Bective were confined to 3 pointed frees for the rest of the half while Ballinlough had 5 more scorers, with 2 points from both Peader Byrne and Michael Geraghty and points from Sean Geraghty , Benjy Smith Lorcan Maguire . The second half started even better when Man of the Match Benjy Smith had the ball in the Bective net in just 3 minutes. The goal seemed to spur on Bective and they piled on the pressure scoring 8 points . A point from Benjy Smith in the 50 th minute sent shockwaves thru the crowd as an upset looked on but it must have blown the lights also as the pitch was plunged into Darkness . Play resumed after a short break and Ballinlough used all their experience gained at Senior level to close out the game. While a black card was issued to a player from both sides the game was played in the right spirit on a dry night in front of an an enthusiastic crowd . Full marks as ever to the hosts St Michael ‘s for having the pitch in such good order after a very long winter . Ballinlough were well served by Derek Muldoon , Mathew Farrell , Gary Reilly and Johnny Reilly . Ballinlough recovered from losing their opening 2 rounds to secure their first points in this Div 3 contest on Friday night. The dry pitch at Dunganny seemed to suit Ballinlough as they played a fast moving game and soon built up a commanding lead with Tommy McCullen working well up front . Goals either side of half time from Mark McCullen and Sean Geraghty gave Ballinlough a good cushion but 2 goals from a resilient St Ultans late in the second half threatened to upset the party but Ballinlough once again found their rhythm securing the win with 2 late points . Best for Ballinlough were James Baugh . Mathew Farrell , Benjy Smith and Sean Geraghty. Well done Lorcan Maguire on being selected Ballinlough's player of the year for 2017! Ballinlough recorded a three point win over Curraha to claim the B Football League Division 4 title in heavy underfoot conditions at Carlanstown on Saturday afternoon. Pictured right: Captain James O' Keeffe raises the B-League cup. ​After an enthralling game in Carlanstown on Sunday afternoon Nobber booked their place in the semi-final of this year’s intermediate football championship with a three point win over Ballinlough. Pictured left: Peadar Byrne was once again Ballinlough's best player. Ballinlough announced themselves as genuine intermediate championship contenders with a three-point win over last years finalists Dunderry in Cortown on Monday evening.